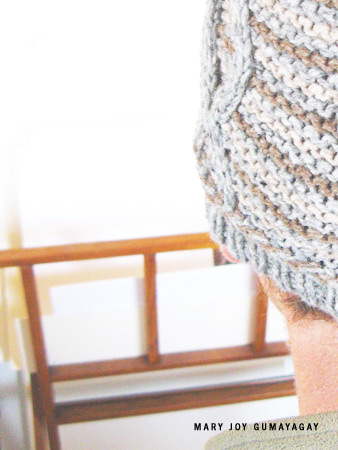 I don’t always take 6½ years to publish a pattern, but when I do, it’s quick, easy, and free. Siurana was knit one midwinter in France, when climbing days meant chasing the sun and freezing while my partner worked on his project. It’s the third hat in The Destination Series, for the climbing areas I know and love. Antalya came first, followed by St. Léger. Now this. Knit in 2009, published in 2016. Siurana is a generous type of hat: a deep, deep brim for pulling down over frosty earlobes and a long, slouchy body for tucking ponytails or braids in. It’s knit as a firmer fabric, for retaining heat. It’s made for the no-nonsense type of activity I anticipate the wearer participating in: muscle-aching, finger-popping, sweat-inducing, endorphin-producing. It’s got cables that reveal themselves slyly, an allusion to the hidden holds of some Siurana routes (at least, the routes I was on). It fits you, your climbing partner, your friends visiting from Cali who skipped the headgear, and the random crag dog enamored with its sheepy heritage. On off days it’s handy for spontaneous cherry picking or mosquito swatting, and can, in a pinch, serve as an oven mitt at a campfire. It’s a utilitarian hat, not made to be pretty but to be worn, and loved, and warshed, and lost, and knit over and over again. Siurana is a free download on Ravelry. This entry was posted in Patterns on May 16, 2016 by Mary Joy. 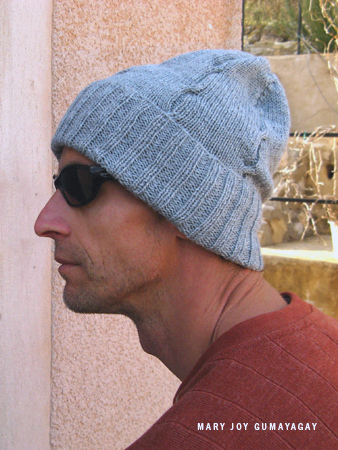 I designed a hat and cowl set called St Léger, after my local crag in Southern France. Knit in Brooklyn Tweed SHELTER in Sweatshirt, Woodsmoke, and Nest. I was just as surprised as everyone else when it finally came out! Fourteen knitters, fourteen design aesthetics, fifteen beautiful woolly items. I’m quite flattered to have been part of this guest designer series. 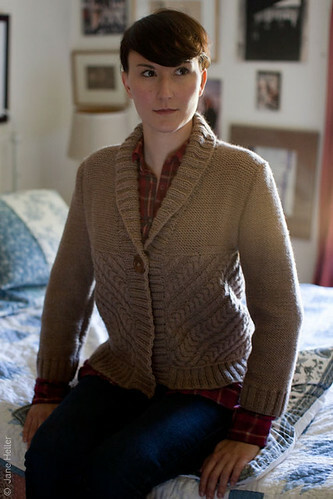 St. Léger is available through the Brooklyn Tweed website. This entry was posted in Patterns on July 28, 2011 by Mary Joy. 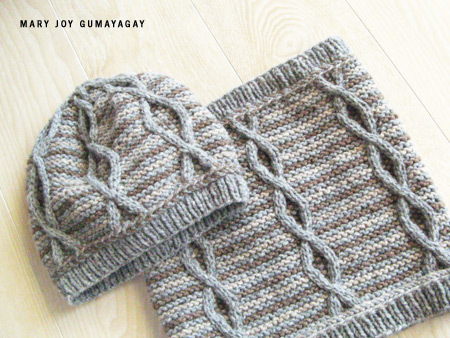 And now it’s out: two of my patterns were published in Twist Collective’s Winter 2010 issue. Meet Samsara. Unusual construction is something I’ve been fascinated by in the last few years, and this (and Antalya) was the result of countless sketches, charts, and pattern drafts. Samsara is a cropped jacket with ¾-length sleeves. The body panels are knit on the diagonal, then joined and knit up. There are some fiddly instructions with regard to the biasing, but it’s all good. A shawl collar completes this jacket. It’s fully charted, so you won’t be doing the increases and decreases blindly! Samsara is available at Twist Collective and Ravelry. 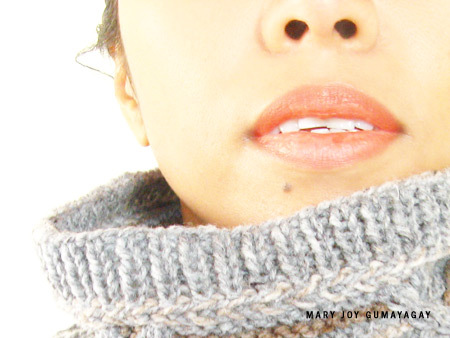 This entry was posted in Patterns on December 8, 2010 by Mary Joy.